Cristiano Ronaldo was shown a straight red card in Juventus' Champions League clash with Valencia on Wednesday. It was the Portugal international's first European match for the Italian giants following his £105million summer move from Real Madrid. All eyes were on Ronaldo to see how he'd perform on the biggest stage in football, given the fact he's won the competition five times previously. 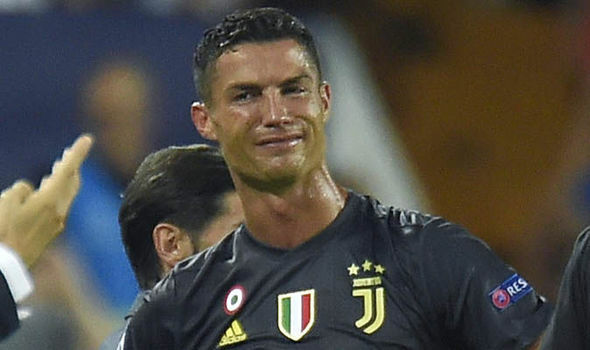 But Ronaldo's night will be remembered for all the wrong reasons after he was sent off in just the 29th minute for a coming together with Jeison Murillo. It wasn't clear what had happened at first as the incident occurred off the ball. There was a slight coming together between the two players, but Ronaldo didn't appear to lash out at his rival with his hand or head. He did however appear to pull the hair of Murillo, which was spotted by the linesman. The official gestured to the referee to end Ronaldo's night early, and the Portugal international was forced to leave the pitch in tears.